Fall is a good time, as well as periodically throughout the year, to do maintenance on your birdhouses, birdfeeders and bird baths. Maintenance will help protect birds from some pests and diseases, and from unwanted visitors. 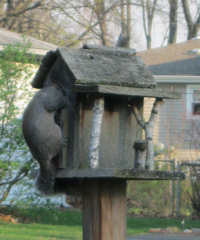 Inspect your bird house and repair if possible. Educator’s Guide to Nesting Boxes (Sections Tips for unwanted guests). 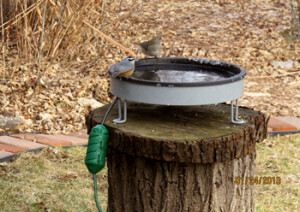 A Red-breasted nut hatch, junco and many other birds take advantage of my electric birdbath during this dry 2012-2013 winter. My local bird store expert also recommends periodic cleaning of bird feeders, including the hulls on the ground,to prevent the spread of disease. Visit AUDUBON’S 3 WAYS TO KEEP YOUR FEEDER DISEASE FREE or CORNELL’S HOW TO CLEAN YOUR BIRDFEEDER website for more information. BTW: There are also non-bleach products specifically for bird house and bird feeder cleaning , but I have not tried this yet. If you tried any, would you recommend them?